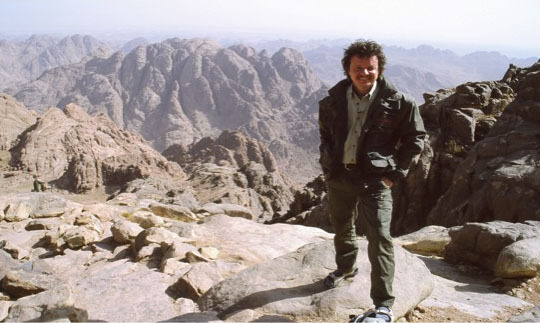 Dr. Möller at the peak of the traditional Mt. Sinai in the Sinai Peninsula of Egypt. 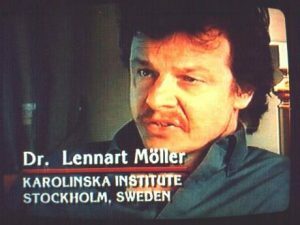 Lennart Möller is from Sweden. He is a research scientist in the field of medicine and DNA-research. Dr. Möller has studied a number of subjects (limnology, marine biology, toxicology, chemistry) at the Universities of Uppsala and Stockholm and has a doctors degree in medicine from the Karolinska Institutet (KI). KI (established 1810) is the medical university of Stockholm (www.ki.se) and one of the leading international medical universities. The faculty decides about the Nobel Prize in Medicine. Lennart Möller has been at KI since 1982 and holds a position as professor (which in Sweden is the highest academic level, in other countries professor indicate a university teacher). Möller is head of the Research Laboratory of Analytical Toxicology and the professorship is in environmental medicine. The research is international to its character with collaborations with many different universities around the world. Möller has been lecturing in, collaborating with and visiting many international universities and has in total traveled in more than 60 countries. In addition to the normal work for a scientist, to publish scientific articles, Dr. Möller has published a number of books. The books are in subjects like theology, ethics, cancer, urban air, environmental medicine, archaeology and scientific images (see "Other Books" on this web site). The books are published by publishing houses like The Swedish Environmental Protection Agency, The Swedish Cancer Society, Prevent, Cordia, EFS, Scandinavia Publishing House, Karolinska University Press and international publishers of the different translations. Under the heading "Other Books" images of the cover of books are shown and for three books web sites are available. The different books are published in seven different languages and there are further translations ongoing.